From paying bills to learning online and keeping up with world events, so much of daily life is conducted online, and customers are craving better internet service. That’s why Kiosk is excited to be working with Sonic to bring news about their fast and friendly ‘net service to new and existing markets. Sonic is disrupting conventional industry practices with top-ranked customer service, an unlimited-internet/home phone ‘Fusion’ service that does away with data caps, a rapidly expanding Gigabit Fiber consumer network, and user-friendly B-to-B net services. 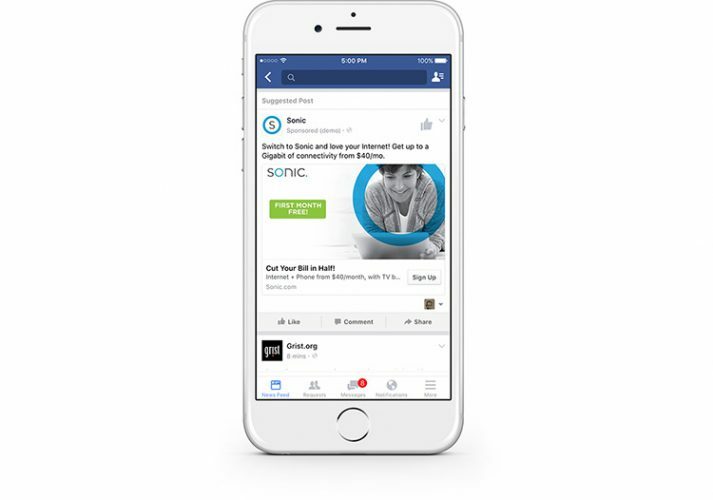 Kiosk is currently bringing the message of faster speeds and better customer service via highly attributable channels, like SEM and paid social marketing (yes, we’re helping Sonic sell their internet services on the internet). Just like Sonic, our coverage will be expanding. In collaboration with Sonic’s creative agency (and North Bay neighbors) The Engine is Red, Kiosk will expand Sonic’s audience and reach by adding additional digital channels, like display and online radio as well as broad reach channels like out of home to support our philosophy of brand response. If you’re looking to rapidly increase your customer base, give Kiosk a call ASAP.